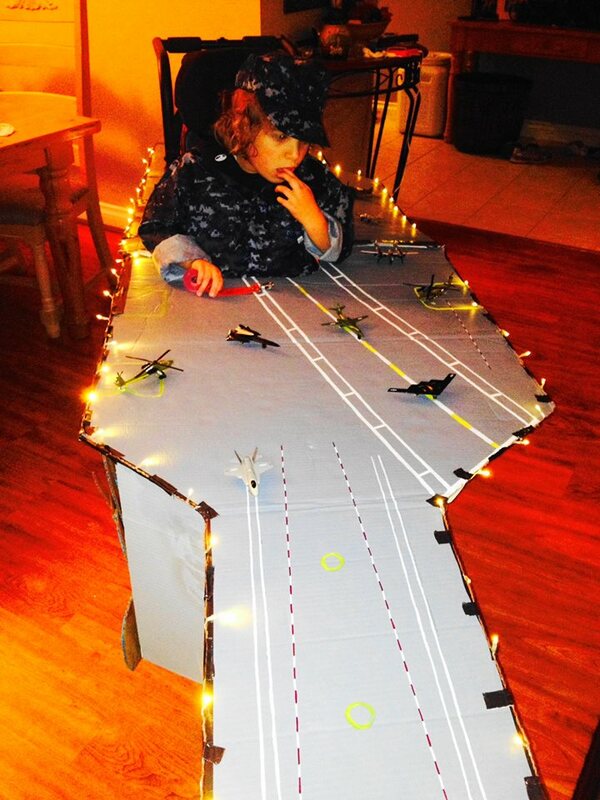 Halloween is in the rear view, but two very sweet pics arrived in the Navy Times inbox that require sharing. These images show Addie, the 7-year-old daughter of Senior Chief Air Traffic Controller (AW/SW) Kevin Kruse and Wendy McCoy Kruse, decked out in an aircraft carrier costume. Addie, in aquaflage no less, serves as the ship’s island while the rest of the flattop is built around her wheelchair. “The sounds of ‘Anchors Aweigh’ playing as she strolled the neighborhood in the USS Addie made for the best Halloween ever!” Wendy wrote in a message to Navy Times. The Navy spouse is president of the Military Special Needs Network, an organization aimed at supporting military families with special needs children. Addie has quadriplegic cerebral palsy, and her mother hopes her daughter is a role model for other families. “The whole purpose of it was to inspire others who have children with disabilities. They can have just as much fun on Halloween as any child,” Wendy said. The family lives in San Diego. Past assignments for dad include the aircraft carriers John C. Stennis and Carl Vinson. 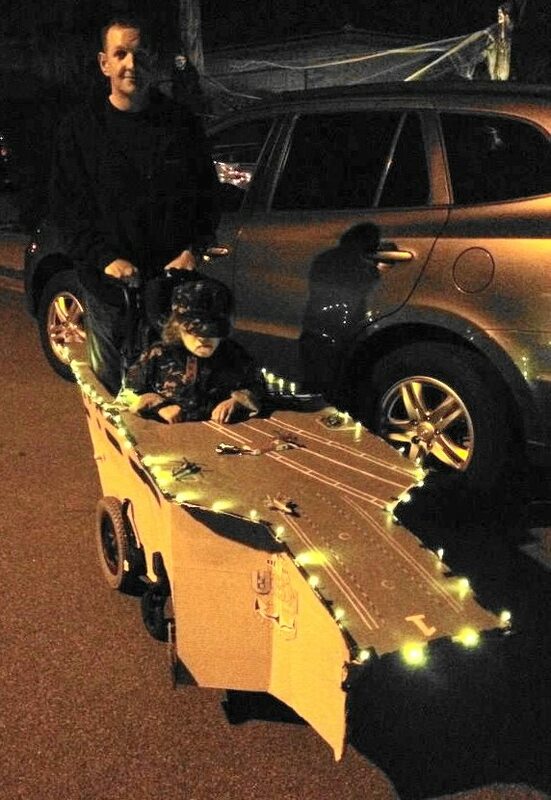 It took two weeks to build Addie’s costume, which also included model planes and flight deck lighting. Sadly, not everyone enjoyed the costume. In a blog post, Wendy relays an incident at school where another mom made a stink about the costume. She said it was taking too much attention away from the other kids and their costumes. Mom, don’t worry about being a momma bear, the other lady was just jealous that your children had a wonderful costume. Enjoy those great moments with your daughters. My husband is in a wheelchair and people say and do awful things. We are happy and that is all that matters . May God bless you and your family. I wanted to tell you how awesome I thought your Halloween costume was. I am currently calling the USS George Washington (CVN 73) home, and I get launched off the front of and land on the back of this amazing ship at least once a day while I’m at sea. Thank you for thinking enough about what we do out here to make my temporary home your Halloween costume! Just wanted to add my thumbs up for your wonderful costume. As far as the snarky comments, remember a phrase that is my dad’s (USN Captain Bob McGinnis, ret.) favorite…Non Illegitimi Carborundum (don’t let the b@$+@rds get ya). I’m proud to call you all part of the military family!